Prayer Line: 915-595-0119 Please visit our for upcoming events!! 1972: The Catholic Charismatic Renewal began in the late 1960’s and reached El Paso in the early 1970’s. A few people who had experienced a personal Pentecost met in a home in El Paso’s Mission Valley to seek the Lord about beginning a weekly prayer meeting where other Catholics could share the Pentecostal gifts and graces and remain authentically Catholic. 1972-1993: The prayer meeting developed into a large inter-parochial group of hundreds, meeting in many different locations from a small hall at a monastery to a Catholic school cafeteria, to the larger halls of two different parishes. 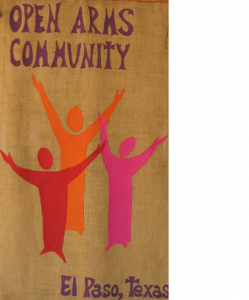 In 1993, the group, now a non-profit 501-c-3 religious and charitable organization incorporated as Open Arms Community of El Paso, purchased an old adobe dance hall at 8210 North Loop Drive. We converted the Felipe Duran Hall, Home of Ranchero Dances, wedding parties and other celebrations, to a place of prayer and praise. The former saloon was converted to our prayer chapel. Our ministries and outreaches had found a home: Centro Santa Fe, Open Arms Center. Since 1993, prayer meetings and Bible Studies in Spanish and English have continued. The Lord has blessed the ministry to the poor. Our Food Bank and Aid to the Needy have grown and developed as the main focus of daily activities. Many volunteers have come forward to help with the hauling and bagging of food for the poor and to help with the weekly distributions of groceries. We provide food packages to some 800 families each month. Volunteers also sort donations of clothes and household goods that pour in from many generous donors, preparing some for gifting to needy families and others for our thrift shop which helps fund the purchase of food as well as operating costs. Monetary donations are always welcome. Read more on our Works of Mercy page. In 2000 we acquired a large piece of property next door to the Center. It was the site of a former drive-in theater and when the For Sale went up, we prayed and felt led to step out in faith to purchase it for the Lord’s purposes. With the help of a group of Open Arms believers called Christian Warriors we had paid off the Center. A local bank miraculously accepted our old dance hall plus the new property as collateral for a new loan. The price was not small, but faithful “Warriors’” pledged support, we have been fundraising, and the loan will soon be retired. Now we believe the Lord has given us a greater vision: to build the Holy Spirit Retreat and Renewal Center on the 12 acres next door. Many more supporters are needed. Read more on the Holy Spirit Retreat & Renewal Center page. New volunteers are always welcome! Contact us to request more information or call us at (915) 595-0589. For more information call (915) 595-0589 or click Contact us. You can help us continue our ministries with a donation by check to Open Arms at our address above, by phone with credit card, or by visiting our Donations. Designate “General Fund”, “Food Bank”, or “Retreat Center Project”. Copyright © 2019 Open Arms Catholic Charismatic Community. All Rights Reserved.